Congratulations to everyone who went home with medals, trophies, Spider Badges, Thistle Badges and Scottish Records. It was a very successful weekend with 4 Thistles, 27 Spider Badges and 16 Scottish Records being claimed over the 2 days. Left-click on the results below to download or view. A special 'well done' to Ruth and Ben, both from Bannockburn Bowmen, who both became Scottish Archery Association Junior Barebow Champions on Sunday. 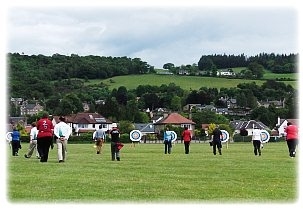 Further Bannockburn Bowmen member achievements can be found in our Member Achievements and Club News section. Many thanks to the mums and dads who worked so hard over the weekend to keep everyone supplied with tea, coffee, cakes and bacon rolls! Thanks also to the members and friends who helped with baking, raffle prizes, setting up and all the other jobs that needed to be done on the day. Their efforts have raised a large sum of money for the club, and led to a very successful and enjoyable weekend.